Have you ever told a client about one of your products or services and heard this surprised reply: “I didn’t know you had that!”? You may have bitten your tongue to keep from pointing out that this particular offering is listed throughout your website, mentioned in every bit of marketing collateral and advertising you produce and also prominently proclaimed by a huge sign over your left shoulder, even as the two of you are speaking! Somehow, instead of whacking this person over the head and yelling, “Hello? McFly!” you thoughtfully go about closing a new sale. But before jumping to conclusions, ask yourself why clients frequently don’t retain important bits of information about your business. We’re going to go out on a short, thick and very sturdy limb and say the problem likely originates from one of two places: 1) your clients aren’t all that motivated to learn about your company; and 2) information you would like them to have isn’t attracting their attention. It’s human nature to not do things we don’t have to do. That’s why we don’t see bald men combing their heads, or why most don’t make their bed everyday if they live alone. We have better uses for our time, so if we aren’t strongly motivated to perform certain acts, we won’t. Therefore, it’s not surprising that random members of the public don’t normally commit the content of business websites to memory, or that some people would be unable to describe a company logo even if their lives depended on it. “But,” you may say, “knowledge is power. My company satisfies important demands, and it’s wise to know how to access critical resources such as those we provide.” This may be true, but we all prioritize which information to acquire, especially in an age where we can Google an answer to any question in seconds. These days, it’s usually safe to feel a need before finding out where to fill it. This brings us to the second point. How does the information you want to convey manage to push through everything else that’s clamoring for your customers’ attention … much less actually stick around in their brains? Well that’s what marketing is all about, isn’t it? You carefully identify your audiences, send precisely constructed communications that will attract their attention—through a medium that has the best chance to reach targets—and do it over and over and over again until they (finally) remember your message. And you’ve got to brand it all so your company won’t be confused with others sending similar information to the same people! It’s a process with countless twist and turns, millions of variables, innumerable nuances and considerations, but never a single perfect solution. Still, we truly believe focused customer outreach and education will be fully worth your effort. (Helpful hint: Let your Pinstripe friends handle it for you!). It’s up to you to make the right impression on your clients—not them—but if things go right, they’ll be glad you did. Could You Develop a Cult-like Following for Your Brand? Star Trek vs. science fiction. Green Bay Packers vs. the NFL. Macs vs. personal computers. In each pairing, the former is an example of the latter, yet fans of a specific “brand” may have little emotional attachment to the broad category. They may even be dismissive or hostile to other entities of the type. These brand enthusiasts know what they like and no substitution will do. They also expect to be customers for life. Wouldn’t you like to have such partisans supporting your business; customers who will ignore your competitors’ promotions and who can be counted upon to defend your brand against all skeptics? It might be possible. However, you’ll never attract intensely committed customers if you yourself don’t sincerely feel your offerings are special in some very important way. After all, you are the first evangelist for your business and if you’re not a believer, how can you expect to attract any followers? As you see, it requires extra effort to convert typical customers into walking, talking (and buying!) brand advocates. And your value proposition may not be one that easily lends itself to cult-like devotion (example: super convenient store hours). But if you get the feeling that your business may be one that naturally attracts a distinct market—one that’s open to a personal connection with a trusted brand—you may find a lot of profit in cultivating an intensely loyal customer base. Some colleagues and I recently shared a lively discussion about business and management books we defined as professional game changers. 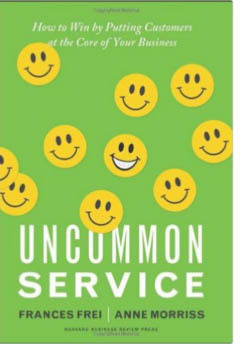 Many titles sprang to mind, with one clearly standing out: Uncommon Service by Frances Frei and Anne Morriss (Harvard Business Review Press). Each of us had devoured its simple brilliance and intriguing premise. The authors pose compelling arguments surrounding the art of making competitive trade-offs to build a sustainable business that’s profitable, scalable and able to deliver service excellence every day. They deliver practical insights into service innovation and actionable ways to win by putting customers at the core of your business. Case studies across a variety of sectors showcase four dimensions — or “service truths” — to illustrate a powerful approach to uncommon service. Truth No. 1? You Can’t Be Good at Everything. Explore this and the other dimensions in the book. It’s a must-read in our service economy.